In my last post, I showed how taking a round of funding logically reduces the available exit options. As a rule of thumb, each round of funding reduces exit opportunities by 10X (assuming a default price-elasticity of 1). Now let’s focus on the specifics of Series A. If you just want the summary, there is a particularly large cliff at Series A: I estimate a 25X reduction. My guess is that the difference is due to early stage VCs wanting bigger multiples than late stage angels and potential acquirers becoming much more price sensitive in the affected valuation range. Here’s the detailed math… Traditional Series A VCs want $100M+ exits. (see here, here, and here). This target makes perfect sense when you work the numbers. Adding up the pre-money valuation and amount raised at Series A from Wilson Sonsini, we see that the typical post-money valuation is currently on the order of $10M. Now, early stage VCs consider 10X returns to be a successful investment (reference here). Result: an exit on the order of $100M is the minimum. Of course, if a company’s Series A investors become convinced they can’t achieve their minimum, they’ll accept less. But there are two issues with that scenario from the founder perspective. First, part of what VCs do when they make a Series A investment is help put the company on the operational path necessary to support a business worth $100M+, a path that requires burning cash. So by the time the investors admit they won’t hit their target, the company is often strapped and the exit options start heading towards “fire sale” valuations. Second, VCs almost always have liquidation preferences, i.e., they get paid before the founders. The combination means failing to hit $100M often means the founders and employees don’t make out very well. Therefore, from the founder perspective, if you take a traditional Series A round, the prevalence of $100M+ VC-backed startup exits is a pretty important statistic. This number is fairly straightforward to estimate. According to Ernst and Young, there were an average of 41 VC-backed IPOs per year from 2007 through 1H2012. For our purposes here, I assume all those were over $100M. According to to CB Insights, there were 111 private technology company acquisitions over $100M in 2012, thought not all of these would necessarily be VC-backed. This data jibes with the NVCA data on VC-backed companies with M&A exits at least as large as their total funding: 92 in 2012, 112 in 2011, and 85 in 2010. Not all of these would necessarily be over $100M, but we’re just using this number as a quick double-check. So given these datapoints, I think 200 is a very gracious rough estimate of the number of $100M+ VC-backed startup exits per year. Now, if we examine the NVCA data on “Early Stage” deals from 2001-2010, we see the average number per year of was almost exactly 1,000. So assuming a relatively steady state, a founder who accepts a traditional Series A round has about a 20% chance of seeing a substantial payout. Consider the alternative. Run leaner. Try to just achieve initial product-market fit or a significant technological breakthrough. Get acquired by a large company for under $50M. The numbers here are harder to find. the CB Insights report covers this price range, but looks pretty inaccurate. For example, it says Google acquired 12 companies in 2012. But Google’s 2012 SEC Form 10-K says it acquired 53 companies–that’s less than 1/4 accounted for by CB Insights. Presumably, it is the smaller acquisitions they miss. To achieve better accuracy, RSCM asked a friend with access to the S&P Capital IQ database to do a quick search for us on M&A deals under $50M from 2001 to 2010. Unfortunately, deal size wasn’t disclosed in many cases. We figured the unreported-size transactions were probably almost all under $50M, but conservatively assumed it was 90%. Given this assumptions, our estimate of the average was 5,000 per year. On the one hand, this estimate is for all private company transactions not just those in the technology sector. On the other hand, we used the number of Google acquisitions as a double check and found only about 2/3 of Google’s acquisitions were in the database. So for the purposes of rough estimation, assuming these errors cancel seems reasonable. Using the spreadsheet from my latest Seed Bubble post, we can estimate that about 22,000 companies per year receive seed stage angel funding. Remember that most of these companies fail before they reach the point at which they could even consider Series A funding. To be gracious, let’s assume 50% make it to that stage. So that means that a company that forgoes a Series A has very approximately a 5K/11K = 45% chance of seeing a payout via small acquisition. Bottom line: if you know a founder received a substantial payout, the probability is about 25X higher that it came from a small exit than a large one. Prospectively, a founder that chooses to avoid Series A is about 2.5X more likely to achieve decent liquidity. Though if you do succeed going the Series A route, the amount of liquidity will likely be much higher. Then there’s the “reputational effect”. Getting a successful exit under your belt is a huge benefit in terms of how people perceive you in the startup world. 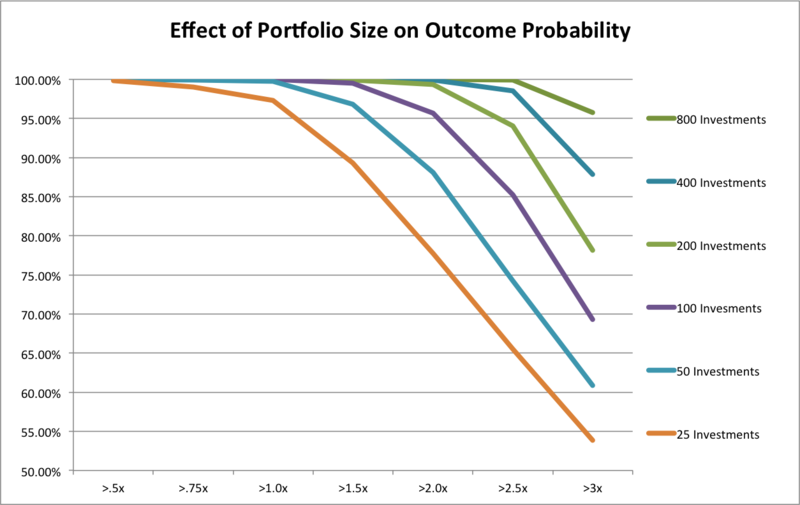 So first-time entrepreneurs should be particularly biased towards higher probability exit options. Especially because even a modest payout helps fund the next startup (where you can hold out for that traditional Series A if that’s your long term goal). Taking these factors into account, a first-time entrepreneur may actually lower the total future expected value of his or her entrepreneurial endeavors by accepting a traditional Series A round. Again, I’m not saying that this path is always wrong. But it’s wrong a lot more often than most entrepreneurs think. Also, I’m not recommending that most entrepreneurs swear off Series A unconditionally. Rather, I’m recommending that most entrepreneurs keep their options open by taking smaller seed rounds and extra angel rounds. Have enough certainty about the technology and business to know what your acquisition price would be before you decide that the traditional VC route is the best alternative. There will be exceptions, of course. An opportunity may be so big and emerging so quickly that even a first time entrepreneur should absolutely take Series A as early as possible. But those situation will be rare. For what it’s worth. Your mileage may vary. Standard disclaimers apply.